As Syria’s civil war enters its third year, the country’s humanitarian crisis worsens each day and the Levant grows increasingly vulnerable to the conflict’s spillover. In mid-February, the United Nations reported a death toll “nearing 70,000.” Today, one in four Syrians is internally displaced or living abroad as a refugee. No dialogue between the Assad regime and rebels has begun, as the gulf between the two sides’ conditions for talks has proven too wide to bridge. If no political settlement is reached, it is possible to imagine that the Syrian state itself will disintegrate, as neither the regime nor any rebel faction is likely to gain control of the entire country. 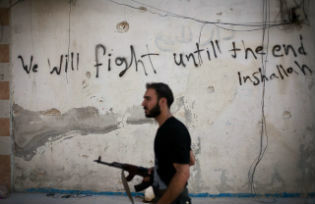 Although the regime maintains its military superiority, the Free Syrian Army (FSA) and other rebels have achieved major victories within Syria and on the international stage. Today, rebels control all roads leading into Syria’s largest city (Aleppo), several border crossings, military installations, one provincial capital (Raqqa), the Al-Ward oilfield, and the country’s largest hydroelectric dam. Events of recent weeks suggest that the regime’s grip over Damascus may be weakening as well. The Syrian National Coalition has been officially recognized as the “legitimate representative of the Syrian people” by more than one hundred governments and just earned a seat on the Arab League. Despite these military and diplomatic gains, it’s unlikely that the Assad regime will be destroyed by the Free Syrian Army unless the tactical balance of power shifts more decisively in the rebels’ favor. Developments that would bring about such a shift include a NATO-imposed no-fly zone, the transfer of advanced weaponry to the rebels, the unification of the opposition, or the regime losing its Alawite support base. Yet the prospects for each of these scenarios are severely undermined by the rise of Jabhat Al-Nusra and other extremist elements within the opposition. Fundamental questions concerning Syria’s future divide Assad’s enemies, and without question the regime has effectively exploited these wedges. Divisions over the role of Islam in governance, ethnic tensions between Arabs and Kurds, dialogue with the regime, and the role of foreign governments have thwarted the emergence of any single political entity capable of representing the Syrian opposition. The opposition first attempted to form a united political front in September 2011 with the formation of the Syrian National Council (SNC) in Istanbul, Turkey. Nonetheless, many Syrians were quick to dismiss the SNC as a Muslim Brotherhood-dominated organization run by exiles that lacked any influence over events on the ground in Syria. Moreover, the relationship between certain SNC leaders and the George W. Bush administration made the organization unpopular among Syrians who feared that the rebellion was being hijacked by the interests of Western powers—especially when the SNC began calling for foreign military intervention. Meanwhile, the SNC’s partnership with Turkey hindered its ability to attract substantial support from Syria’s Kurds and secular Arab nationalists. As the United States and other allies expressed increasing frustrations with the SNC’s failure to achieve political unity, a new body – the Syrian National Coalition – was formed in Doha, Qatar in November 2012. The old SNC simply became one faction in the new SNC, which is essentially an umbrella organization. However, the current SNC’s attempts to unify the opposition have proven equally futile. The March 24 resignation of SNC leader Mouaz al-Khatib further underscores the coalition’s incapacity to establish itself as a cohesive entity that is capable of luring in advanced weaponry from foreign governments while representing and controlling the opposition. Despite occasional grumblings, France and the United Kingdom have so far followed Washington’s lead and refused to arm the rebels with weapons that could tip the balance against the Syrian regime. Meanwhile Jabhat Al-Nusra’s rise within the opposition’s ranks has neatly catered to the Assad regime’s narrative of an extremist opposition backed by foreign powers. The regime’s portrayal of the crisis to Syrian minorities as a sectarian conflict has worked like a charm as Jabhat Al-Nusra and other Salafist factions (including Ahrar Al-Sham Brigades, the Suqur Al-Sham Division, and others) have stoked sectarian tensions. Amid the looting of Shia mosques and Christian churches by Sunni insurgents, Syria’s Alawite, Christian, and Druze communities have remained overwhelmingly loyal to Assad, fearing a vengeful Sunni backlash if the regime collapses. If Jabhat Al-Nusra and the Muslim Brotherhood’s ambitions include seizing control of the entire country by force, the regime will not be their only stumbling block. For nearly six months, the Kurdistan Worker’s Party (PKK) and its Syrian affiliate branch – the Democratic Union Party (PYD) – have maintained control over most of Syrian Kurdistan. Recent months have shown that a Turkish-PKK proxy war is being waged inside northeastern Syria as Jabhat Al-Nusra has targeted the PKK in the Kurdish-majority areas. Considering that the Turkish military’s three-decade campaign to eradicate the PKK in southeastern Turkey has been a total failure, it does not appear likely that Jabhat Al-Nusra and other militant Islamist organizations will defeat the PKK in Syria anytime soon. Ankara’s strategy of arming the jihadists with the intention of unleashing them against the PKK has backfired, as Jabhat Al-Nusra’s behavior in northern Syria has only earned the PKK greater legitimacy within Kurdish and Arab circles alike. There is every reason to expect more territory to fall under rebel control during the conflict’s third year. However, given the West’s reluctance to intervene militarily and the regime’s strong support base from nearly one-third of the Syrian population, it is likelier than not that the Ba’athist order will only be damaged—not destroyed—by further rebel gains. Unless a tactical shift in the balance of power occurs, it is unlikely that either the regime or the rebels will gain control of Syria’s entire territory, leaving open the possibility that the state will fragment along sectarian lines. Ideally, the regime and rebels will both accept that a military victory is out of the question and bridge the gap between their demands for a political dialogue before entering peace talks. In reality, however, the perception that measurable gains on the ground could enhance either side’s leverage at the negotiating table—to say nothing of the role that foreign powers have played in stoking the conflict—makes any enforceable ceasefire unlikely. In the center of a highly volatile region, the dismemberment of the Syrian state would constitute a geopolitical tsunami capable of sweeping other weak and destabilized countries into their own bloody morass. Yet with military and diplomatic efforts alike in stalemate, the “Somaliazation” of Syria appears increasingly likely as various actors establish de facto control over portions of the state with no authority governing from the center. Giorgio Cafiero conducts research on Middle Eastern and North African politics for Foreign Policy in Focus, a project sponsored by the Institute for Policy Studies. He holds an M.A. in International Relations from the University of San Diego. During 2011 Mr. Cafiero conducted award-winning research on the conflict in Western Sahara for the American Task Force on Western Sahara.